These presentations are designed for dedicated Seventh-day Adventist Christians who value the counsel in the Spirit of Prophecy. Perhaps you've come here wondering why a Christian lady would actually choose to only wear skirts/dresses in our western society when the majority of women wear pants most of the time. Perhaps it seems radical to consider wearing a modest skirt every day when most women are going around in jeans, slacks, Capri's, shorts or stretch pants. Why do some ladies insist on wearing these modest skirts? Are they just weird and eccentric, not worthy of a second thought? Well, perhaps it is worthy of a closer look. Did you know that some of these ladies are deeply spiritual, committed Christians who are following a conviction they believe has been placed in their hearts by the Holy Spirit? Many of them have wrestled with God over this conviction, and after many prayers, have humbled their hearts in obedience to the voice of God speaking to their souls They have stepped out of the path of worldly conformity and gone against the tide to uphold a godly principle. This is not an easy decision. It requires moral courage and dependence on God to break out of society's mold. Pride dies hard, and the desire to be accepted is powerful. But the grace of God teaches us to deny ungodliness and worldly lusts, and brings us into conformity to the will of God. Grace leads us to go against the grain of self, and purges it out of our lives. So, what are the reasons why these women make this difficult decision to oppose worldly fashion? 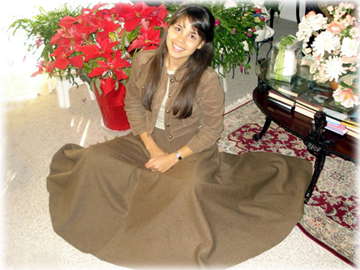 New-January 1, 2013 : "Your Clothes and Your Heart"
What Blocks Revival and Reformation?